A native raspberry? Yes, and it tastes great! The berries turn from red to black when it can be confused with blackberries. The white arching canes are impressive with their powdery white coating, but are not for the faint hearted. Not only is this plant armed with good sized thorns, it reroots where the canes touch the ground. 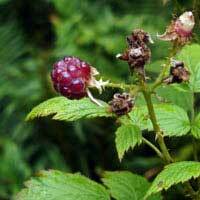 Great replacement if you desire an edible landscape where you are eliminating invasive blackberries.